Fiddler on the Roof’s matchmakers: Yea or Nay? Two actors, two views on matchmakers and one play about arranged marriages. 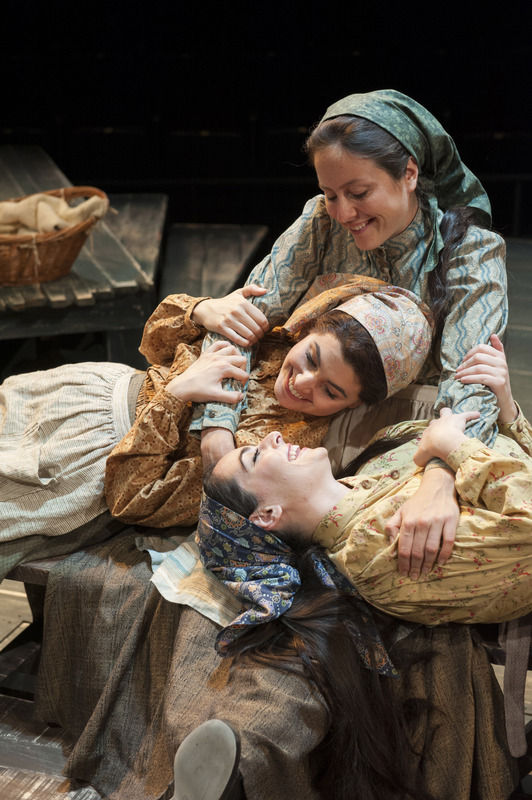 Columbia resident Valerie Leonard is a matchmaker (Yente) and grandmother (Tzeitel) in “Fiddler on the Roof” at Arena Stage in Washington, D.C. Dorea Schmidt plays Leonard’s eldest granddaughter (Tzeitel) whom Yente is trying to pair. Q: What do you think about matchmakers? Schmidt: It is scary to me. I feel for Tzeitel. To not have a say in whom you’re going to spend the rest of your life with – it freaks me out, especially if there is someone else that you are in love with. Q: Have you tried setting up friends or did anyone ever match you up with someone? How did it go? Schmidt: Oh no. I try to stay out of it. Each relationship is so different and what people want is so different. I’d rather they just go after it themselves, and then I’ll be right there with confetti if it works out and ice cream if it doesn’t. Leonard: I had never ventured into matchmaking before Fiddler, but because I was cast as Yente, I was asked to be a matchmaker for The Washington Post ‘s Date Lab. That was stressful, but fun. I never met a matchmaker I didn’t like! Q: How do you juggle two roles in one play? What techniques do you use for keeping the right lines with the correct character? Leonard: I worked on creating one character at a time. Once the scenes were staged, it was easy to hold on to who I was in each scene. And thank goodness my two characters have distinctly different costumes! Q: How do you prepare for a performance? Schmidt:: I like to come to the theater early and warm up alone. It helps me get grounded and focused. I also spend a lot of time daydreaming about Tzeitel and her world. Q: I read you were in your school’s production of Fiddler on the Roof in ninth grade. What was your part, and what was that experience like? Schmidt: I played Hodel, and the experience was hilarious. My family was living in Costa Rica at the time, and it was at our international high school. I remember really loving the story, but the ensemble was never on the same pitch, the orchestra was always a bit sharp and most of us brought in our own costumes. I’ve got a recording you can watch, but you’ll have to endure the Costa Rican cameraman who sings along in Spanglish. Q: Have you applied anything from that early experience to the Arena Stage production? Schmidt: When I re-read the script for auditions, it had been 12 years, but I still remembered certain lines. Otherwise, no. I’m a different person now and this is a very different production. Q: In what ways are you similar or different from Tzeitel? Schmidt: I feel pretty similar to Tzeitel. She is a homebody and loves her family, her community, its traditions and her God. She is passionate and feels deeply, but is also super silly, and has found a man who she can be totally herself with. She is extremely determined, and when she wants something, she fights with her whole soul to get it. Fiddler on the Roof runs through Jan. 4. Megan Kuhn is a financial literacy advocate by day and a theater fan by night. One of her favorite possessions is the red jacket from “Dead Man’s Cell Phone” that she purchased at a costume sale at Woolly Mammoth Theatre. Contact the author.